Coloring books for adults have become an ultra craze lately. And, unlike most other crazes, coloring is actually very beneficial to your health. According to numerous psychologists and doctors, coloring is a stress-free activity that helps adults to clear their minds of their daily stresses and give their brain the break it so desperately needs. But coloring has many other health benefits, as well. Coloring is more than just a hobby or a way to spend a rainy afternoon, it can benefit you in many ways. Mandalas, which has concentric and geometrical patterns in them, were some of the first coloring studies, done by Carl Young as early as the first half of the 20th century. Through this study, Young found that, for adults, coloring lowered stress levels and calms them down. The act of coloring not only requires creativity, but also logic. When we use logic to choose a color for something specific, like a tree, we activate the analytical part of our brain. When we choose to mix and match colors, however, we activate the creative side of our brain. This helps to incorporate both areas of the cerebral cortex, which controls your vision and helps with coordination and fine motor skills. Coloring for adults is a great reminder of the carefree life they once lived as children. Not only does it bring your mind to a carefree place, far, far away, but it reminds you of a time when stress didn’t exist, yet. This allows the artist to look to the future with higher hopes and a brighter outlook on life. One of the most beneficial aspects of coloring for adults is that creativity spark. Adults who color on a regular basis claim to have an easier time choosing colors for their clothing and their interior decorating. 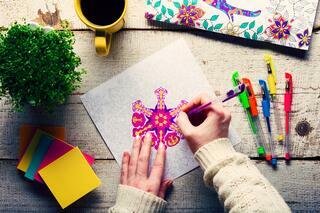 Coloring can also allow for adults to become more creative in the work place and to think more analytically. Coloring can greatly help adults who suffer from Alzheimer’s or dementia. It is important for those with Alzheimer’s, dementia or any similar memory loss disease to be involved with activities that stimulate their minds. These stimulating activities will help them to remain engaged and in touch with the outside world. In addition to giving them a sense of purpose, coloring can also help to reduce feelings of agitation and aggression, which can be an issue among these afflictions. Meditation is really all about de-concentrating. Coloring allows you to do this because your brain naturally enters a world of ease and relaxation and all you think about is what you’re coloring. So, if you find yourself stressing out, reach for those colorerd pencils and that coloring book and get to de-concentrating and de-stressing!